Humans: funny species we are… We love one moment and hate the next. We are friends with people for years and then discard them for perhaps a miss understanding of communication. Acceptance no matter how difficult it maybe. I often wonder if we truly lived in a world with “Oneness for all” accepting each other for who we are, without trying to change the other person, what a beautiful world we would live in. All this wondering came from this picture which was posted on FB this morning. 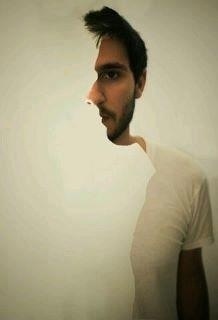 I am a right sided thinker (which I love) and I see both, half a face and the man looking to the left side. Which made me wonder this morning, no matter what someone sees in another individual, they are their own person and acceptance is a beautiful way to go through life!